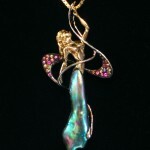 One of a kind reclining 14K yellow gold mermaid is on a 16.4 ct. natural Abalone Pearl. The pendant is an original pendant hand made by Kirk Milette. High quality natural pearls like this are extremely rare, approximately one in hundreds of thousands of abalones will have a loose pearl of the size and quality. Beautiful colors, luster and size of these fine large natural pearls set them apart from anything available on the commercial market. This natural Abalone Pearl was originally found in the 1970’s or 80’s, off the Pacific west coast. Kirk acquired it from Lowell Jones in 1989. 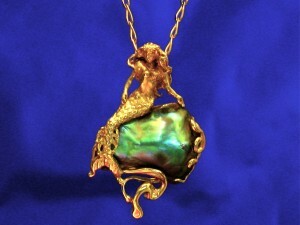 The pearl was set in 2006, and sold to a collector from the Virgin Islands. One of the premier pieces Kirk Milette has offered for sale at the Sawdust Art Festival in Laguna Beach. To this day is one of the most asked about designs in his photo reference material . Other collectable Abalone Pearl pendants and ring designs are available either from the completed pieces at Kirk Milette’s Jewelry shop or by custom ordering from a variety of Natural Pearls he has collected over the last 30 years. Kirk adds new exciting designs for you to choose from. 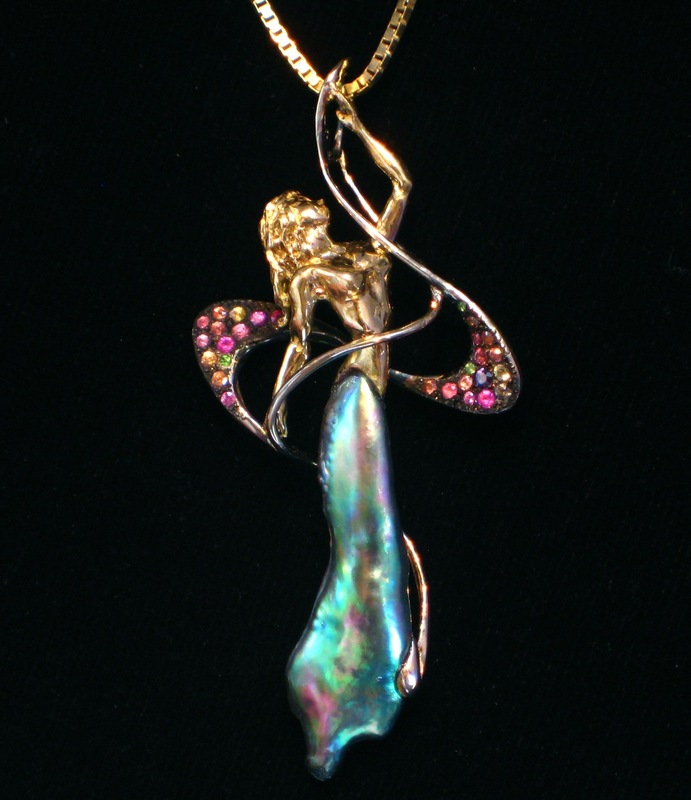 many of these one of a kind pieces can not be duplicated, one of these rare pieces is this Natural Abalone Pearls Dancer in 18K with multi colored Sapphires and Tsavorite Garnets. Kirk Milette Jewelry can create a personal custom design.